The end of the “Rising Action” story arc ends with about as much spectacle as we’ve seen from its beginning in issue #18. McKelvie presents us with an array of spreads and splash panels (heavy emphasis on the splash) that hammer the major moments of the fight between Team Underground and Team Valhalla. We see Ananke finally brought low, and we get a little bit more explanation for why she’s been so murder happy since the story’s beginning; more importantly than that (because Ananke’s nonsense, as interesting as it is, is secondary to the question of how these characters react to extreme and not-so-extreme circumstances), Laura gets a little bit of catharsis for the trauma of her family’s murder, and we end on a major question. The cover for this issue features Minerva for the first time, and unlike the other entries in this cover series, she’s not shown in the midst of a performance, but peering at the reader from behind the guts of the mysterious machine that Ananke intends to use to sacrifice her. The cover’s lighting tips us off that we’re looking out from the machine’s inner workings which, if you want to get super critical (in the academic sense), suggests a kind of complicity between the reader and Ananke’s ongoing sacrificial project. Minerva is the last god Ananke is trying to off to achieve her ends, and this cover puts the reader at the center of the method by which she intends to consume Minerva for her own ends. When in doubt about textual criticism, assume that stuff is about the creative process and the audience is probably doing something harmful to the creator or a creator surrogate. 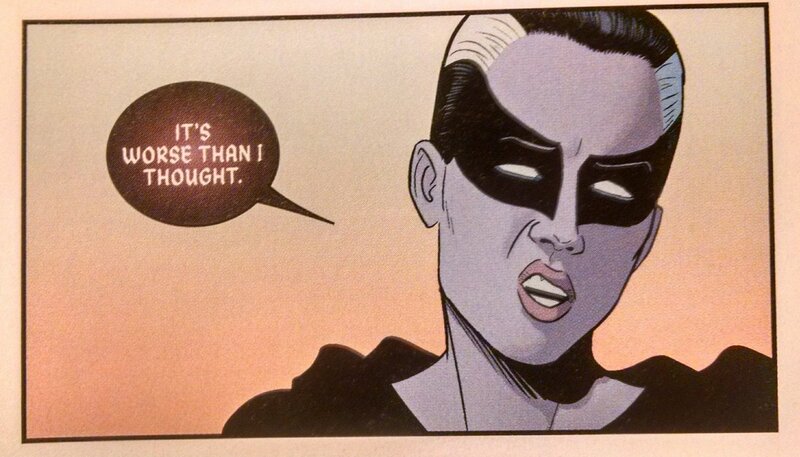 Thanks, Gillen & McKelvie. Seeing as this is the resolution to the arc, there are a lot of ends to tie up, so the pacing of the issue shifts from luxuriating in action sequences to getting the primary conflict wrapped up quickly so there’s room for a big interpersonal confrontation among the gods in the depths of Valhalla. We’ve had enough whizbang to last us for a while in the preceding issues, so instead of spending a lot of pages on finishing the fight, McKelvie gives us a double page spread that captures all the individual fights that carried on in the last issue before zooming in on Woden, who decides he’s reached the battle’s inflection point. The readers know that Woden has been party to most of Ananke’s machinations, even if she kept him in the dark about specifics (like the point of all the murders), but the rest of the Pantheon don’t, so he arranges to throw the fight in a way that gives him plausible deniability in case Ananke somehow manages to pull out a win. 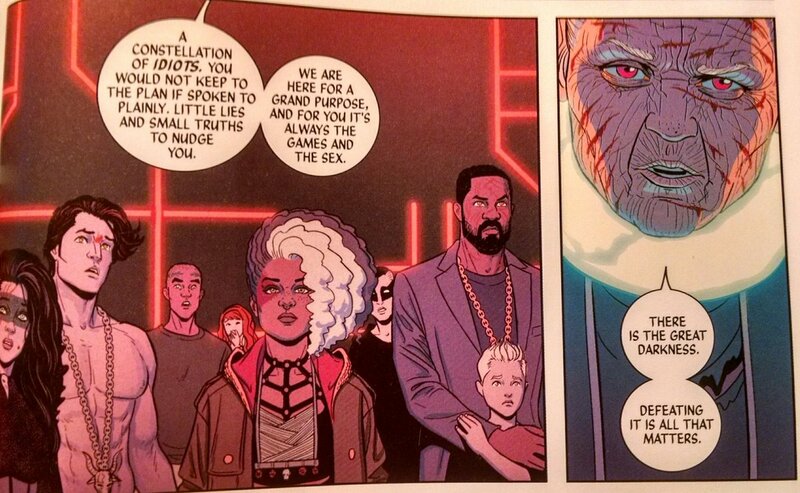 The main event of the issue is the extended conversation among everyone who’s not unconscious (Woden allows himself to be incapacitated and Sakhmet gets knocked out by Baal after she refuses to agree to a ceasefire) in the depths of Valhalla before Ananke’s murder machine. Ananke goes on a pretty good tear complaining about the general dysfunction of the gods and her frustration at having to manage them for millennia. It’s exhausting keeping the Pantheon from running amok while she tries to orchestrate sacrifices for combating the Great Darkness. We still don’t have any clue what she’s talking about with that beyond her vague descriptions of the pre-civilization gods; Ananke seems to be serious about this particular problem, so maybe there’s something to it, but on the other hand she’s also really good at manipulating everyone into getting themselves killed. Whether this is a legitimate problem she brings up or one last gambit to get the gods to release her will have to wait for further explanation later. Out of all the back and forth of the basement discussion, a pattern of motivations emerges. Laura and Ananke are in direct opposition to one another (beyond simple enmity) because Laura, in her new role as Persephone, represents the complete disruption of Ananke’s imposed order. Persephone is the thirteenth in a Pantheon of twelve, defies the normal rules for miracles (she can affect Cassandra and break Valhalla’s walls; perhaps her particular talent is breaking down obstacles in her way), and she’s looking to take Ananke out. She resists manipulation in a way that makes it very hard for Ananke to work around her–if the situations were reversed, Ananke would absolutely kill her. Even though it’s hard to tell what precisely Ananke’s ultimate goals are, we know that she has them, and she constantly works to make her goals happen. She gives the gods a purpose (whether they like it or not); under Ananke’s guidance, we know that the Pantheon means something. Cassandra’s role is less in conflict with the others so much as just trying to slow everything down so the gods can get some answers. She wants to keep everything grounded in reality, but she’s actually really bad at it. This is what happens when you have a nihilist trying to wrangle a bunch of gods. Still, she jumps into the role of “grown-up” with both feet quite readily after everyone confirms that Ananke is trying to kill them all. One begins to wonder if Ananke’s relatively quiet frustration at the gods’ behavior is just Cassandra’s rage after being worn down by multiple millennia of herding a bunch of extremely destructive cats. Ultimately Laura overwhelms all other points of view; Ananke killed the Wilsons as simple collateral damage, and she has to pay for that. Persephone is the “Destroyer” and she lives up to it, showing total indifference to what the rest of the Pantheon wants. The order of Ananke is over, and now, without anyone left to act as a guide, Laura declares a free-for-all. Theology of necessity makes way for a messy existentialism. Looking forward to reading this issue! I almost quit the series in the beginning, but it captures my interest enough to keep on going back. I think the conclusion of this arc was the point where I knew for sure that I wanted to see how everything plays out. After re-reading the earlier arcs a few times I really enjoy what they’re doing, but a lot of that is in retrospect of what follows. I’m taking a couple weeks’ break from my blog after today since it’s the end of the school year and most of my downtime is just me recovering from stress at work. When I come back though, I’m gonna start with the 1831 WicDiv special (it was published between Rising Action and Imperial Phase I), and I’m already looking forward to digging into it. Heavy overtones of Frankenstein. Yes, I want to read the 1831 issue too! I think that era will be fascinating to see some of the Gods in other forms. Enjoy your blogging break.